The Kwame Nkrumah memorial park, popularly known as Kwame Nkrumah Museum, is one of the major tourist sites in Ghana today. It is also the final resting place of the first President of Ghana. 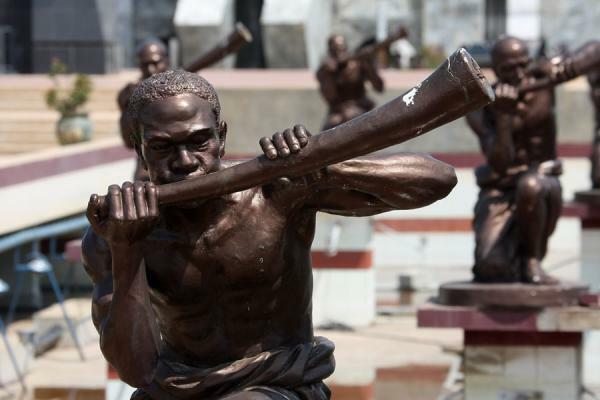 This Memorial Park was dedicated to him to celebrate the role he played in attaining independence for Ghana, known at the time as Gold Coast. Gold Coast as history has it, was under British colonial rule until Kwame Nkrumah together with other nationalists fought tirelessly to liberate the country. As a result, the name of the country was changed from Gold Coast to Ghana on the 6th of March 1957. The name Ghana was adopted from the Old Ghana Empire of West Africa and it means “War King”. The Kwame Nkrumah Museum has gained its popularity in Ghana and beyond, because of the role Kwame Nkrumah played during the struggle for Ghana’s independence and also for his pan-African ideologies. Born Francis Nwia-Kofi Ngonloma, and known by many as Kwame Nkrumah, Nkrumah served as a politician and revolutionary who strongly believed in the concept of pan-Africanism just like W.E.B. Dubois, Marcus Garvey, Julius Nyerere and many others. Nkrumah advocated for total emancipation of the African continent from colonial rule and the forming of a union of all Independent African states. This later led to the formation of the Organisation of African Unity on May 25th, 1963 at Addis Ababa after a series of meetings and oppositions by some African leaders. By the formation of this organization, Nkrumah’s dream of giving Africa one common voice became a reality. Even though Nkrumah faced opposition, he struggled through to make his dream a reality. This has made the name Kwame Nkrumah a known name worldwide. Even after his death, his ideologies stayed on through his books. Copyright © 2018 Ministry of Tourism, Arts and Culture. All Rights Reserved.